Firebird 3 brings numerous innovations, such as the long-awaited full SuperServer’s SMP support, network and database encryption, local user authentication in the database, improvements in the communication protocol, in addition to several new features in different areas of the DBMS. All this made the migration process from an older Firebird version a bit more complicated than it was in previous versions, where, basically, all you had to do was replace the server with the new Firebird version or, at worst, a backup and restore of the database. With Firebird 3, you have different user management plugins allowing the same user to exist in several different plug-ins, with different passwords. The SYSDBA is now optional, as well the use of the security database (you can use any existing database as the security database). You can do this short test and see if you are prepared for Firebird 3. The guide is now available both in PDF format (128 pages) and printed. The table of contents can be seen in the end of this page. The migration guide has been VERY helpful and saved me a lot of time. I have been making changes to our product and its installation. Your guide made it very easy to understand what changes were needed to transition to FB 3. Thanks for putting this eBook together! It is certainly well worth the money I paid for it. 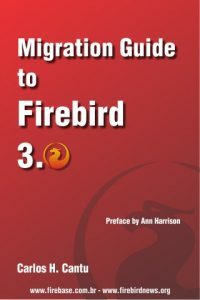 Carlos H. Cantu is the maintainer of the FirebirdNews site, FireBase (biggest portal dedicated to Firebird in Portuguese language, with + 70,000 registered users) and author of two Firebird books (Firebird Essencial and Firebird 2, both available only in Brazil). He also organizes the biggest Firebird Conference in the world (Firebird Developers Day), with an average of 450 attendees each year, and currently in its 15th year. The book is available either in PDF format and in printed format. For the PDF version, buy it using the button below. You will receive your copy in the email informed (make sure to check your antispam folder). The eBook will be sent to the email informed below in 24h after the payment is confirmed (double check if you wrote your email correctly). PS: Brazilians must buy the PT-BR version of the book at FireBase. For Portuguese speakers living outside Brazil, buy the book here and write a note in the comment field asking for the PT-BR version of the guide. If you don’t have a PayPal account, or do not want to create one, you can buy the eBook at Paypro.